The Rockefellers monopolized American medicine in the 1920s. They, along with I.G. Farben, Germany's leading industrial organization, held the monopoly on the world's chemical and pharmaceutical industries. The Rockefellers and I.G. Farben worked together before World War II and during World War II. For all practical purposes, the Rockefellers and I.G. Farben were the Third Reich. But then, unfortunately, if you're a true researcher, you don't even stop there. Suddenly you get laid out all of the other more insidious, more horrifying documentation, such as who also gave rise to Hitler's racial hygiene program - they're the same people. They funded it. It was the Rockefeller family that built and funded the Kaiser Wilhelm Institute for Anthropology, Eugenics and Human Heredity, which was run by Swiss psychiatrist Ernst Rudin, who was named president of the worldwide Eugenics Federation in 1932. Now that's real well articulated in that book published by St. Martin's by Aarons and Loftus called The Secret War Against the Jews. And also another very good book by Little Brown called Martin Bormann: Nazi in Exile. Martin Bormann, like Hitler, was never found. It's only come out recently on the History Channel that they admit it's likely that the carcass that was found in the bunker in Berlin was not Hitler's. I just saw that the other day on the History Channel. It was either the History or Discovery Channel, one of the two. Martin Bormann is clearly known to have skipped town and was never found. This was Germany's principle money man. He was in charge of the Nazi war chest. The entire German economy was under his direction. He was the liaison with the banksters, the Rockefellers. He laundered half of the remaining Nazi war chest through the Chase Manhattan Bank. The Paris branch, which remained open throughout the German occupation of France. And of course there was congressional testimony as to how the Rockefeller family and Standard Oil were operating and making fortunes off both sides during World War II. When Hitler and Martin Bormann knew they were going to lose the war, they invested their treasury in 750 corporations to produce a monopoly over the world's pharmaceutical and chemical industries. 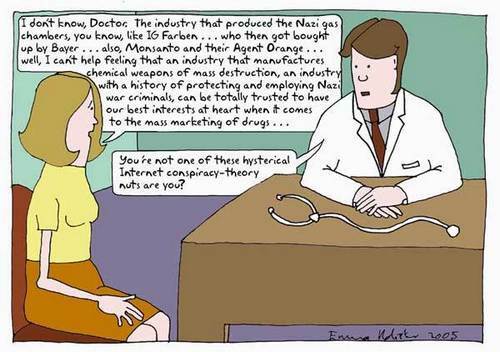 Hitler and Bormann invested heavily in Merck and other pharmaceutical companies. They not only knew that would be a good way to make money as a future investment, but they also knew that, given the Holocaust, you can mass exterminate people through chemicals, gasses and pharmaceuticals. You can take people out untraceably that way. So that was the target and primary objective for the rise of the Fourth Reich. That's what's going on today. The Nazis planned for it, they even had a term for it - "neue Ordnung," which means New Order, New World Order. This today, this New World Order, is the rise of the Fourth Reich. This is precisely what they envisioned and then carried out. 1943 plenipotentiary for Italy of the Reich Minister for armaments and war production, military economist chief industrialist responsible for Auschwitz . 1948 found guilty of "plundering" and "enslavement" and condemned to seven years detention. Released 1952. 1948 found guilty of "enslavement" condemned to eight years detention. Starting in 1954 chairman, deputy chairmen and member of the boards of: Chemie Gr�nenthal, Pintsch Bamag AG, Knoll AG, Feldm�hle Papier- und Zellstoffwerke, Telefunken GmbH, Gr�nzweig & Hartmann, Internationale Galalithgesellschaft, Berliner Handelsgesellschaft, S�ddeutsche Kalkstickstoffwerke, Vereinigte Industrieunternehmungen (VIAG) with its subsidiaries Scholven-Chemie and Phenol-Chemie as an advisor to F. K. Flick und of the US Industrialist J.P. Grace is entangled in the early eighties in the "Flick scandal"
1948 found guilty of "plundering" condemned to four years in prison. Released 1950. 1956 honorary chairman of the board of Rheinish steel plants. SS Obersturmbannf�hrer, military industrial leader, awarded the "friend of the Reich leader SS" cross. 1948 found guilty of "enslavement" condemned to six years detention. 1952 supervisory board member of Ruhr-Chemie and Kohle-�l-Chemie among others. 1955 supervisory board member of the "new" Farbwerke Hoechst. In the same year elevated to supervisory board chairman elect � Karl Winnacker said "in the meantime the liquidation conclusion law had been issued and freed us from all discriminating regulations. So we could add Friedrich Jaehne, chief engineer of the old IG, to the supervisory board. He presided over this committee until 1963. In 1945 none of us would have thought that the two of us would be able to co-operate at the head of our company ". Member of the IG FARBEN executive committee 1926-1940, chairman of the board 1940-1945, director of the coordination center W, director of the Reich office for economics, plenipotentiary for special questions on chemical production, military industrial leader. 1943 Knight's Cross for Distinguished War services. 1948 found guilty of "enslavement" and condemned to six years in prison. Released 1950. 1955 board member of Huels GmbH. 1952 honorary professor of the University of Heidelberg , Dr. rer. RK h.c. the University of T�bingen , 1953 Dr. Ing. E.h. of the TH Munich, 1955 Distinguished Service Cross of the Federal Republic of Germany, Bayer service medal, 1960 Dr. rer. pole h.c. the University of Mannheim, honorary senator of the Universities of Mainz, Karlsruhe and T�bingen, honorary citizen of the University of Stuttgart, honoury citizen of the city of Ludwigshafen, 1967 Schiller prize of the city of Mannheim, president of the federation of the chemical industry, vice-president of the Max-Planck company, the company of German chemists.